It has been a busy month. Read on for translation of the alphabet soup title of this post. I started February with the intention of publishing a manorial term each day, building a glossary, as my contribution to the Family HistoryWriting Challenge (FHWC). You may have noticed a lack of posts after the first few days. I will post at least 28 terms, but at a slower rate. Life and other genealogical activities intervened, in particular Who do you think you are? Live in London from 20 – 22 February. 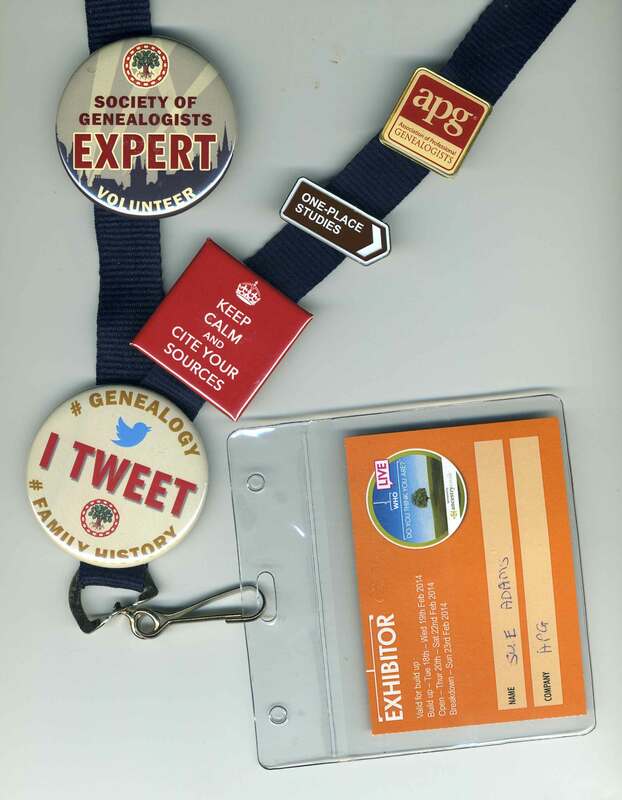 I helped out on the Association of Professional Genealogists (APG) stand and gave advice as of one of the Society of Genealogist’s ‘Ask the Expert’. It was truly gratifying to read a will for one lady and explain all the manorial land terms it contained. She had the faded photocopy of the will for several years, and had managed to read parts of it but did not understand the ‘gobbledy-gook’ legalese. That reminded me of how much my paleaographic skills and legal knowledge have progressed in the last 5 or 6 years. During the show I joined the Society for One-Place Studies. Spot the badge! I have plans to explore the records of a manor in detail, which should help untangle some of my ancestral relationships. The place name features in the tag cloud. That’s all I am going to reveal right now as my first not-so-simple challenge will be to determine the boundaries of the manor.